The arrangemant of the actuator on the axle offers essential technical advantage. The tube inside the valve can be shifted axially. The tube is sealed by a metal seal to the atmosphere. Tube and valve actuator are the only flexible components inside the valve. The pneumatic actuator is also sealed by a metal seal. Attrition by frictions cannot happen. The valve is maintenance-free. 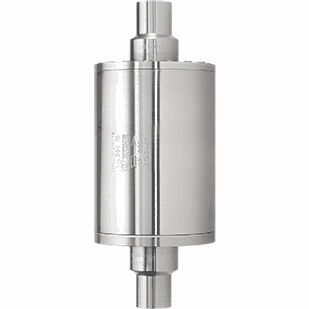 Currently this valve is available in size DN 40/PN 18 with pneumatic actuator and in “normally closed” position. Other sizes, pressures and actuators will follow or will be manufactured upon request. Any standard safety positions are possible.